RIAT this year saw the arrival of the Protector from the US, paired with the announcement that RAF Waddington will be the main operating base for the aircraft, which continuing the foundations of flying Reaper, will operate this next generation, world-leading aircraft. The Defence Secretary also presented two British pilots with 1,000 flying hour certificates after they reached the milestone in the submarine hunting [P-8A] Poseidon Maritime Patrol Aircraft being purchased by the UK. Squadron Leaders Mark Faulds and Ian Tuff reached the achievement as part of their time training in the Seedcorn crew with the United States Navy. Speaking at RIAT, Defence Secretary Gavin Williamson said: “The Royal International Air Tattoo is a perfect example of how Britain continues to lead the way in airpower, showing the story from the historic Lancaster, to the stealthy F-35 Lightning and now the incredible arrival of the Protector. 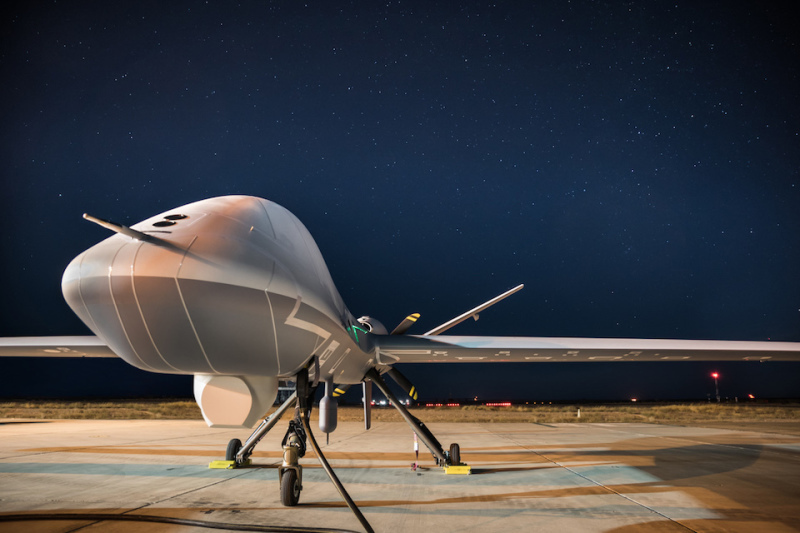 In a historic first, the aircraft flew non-stop from North Dakota, United States, to Gloucestershire in a flight that took over just over 20 hours, setting the record as the first Medium Altitude Long Endurance Remotely Piloted Air System (RPAS) to transit across the Atlantic. Designed to double the RAF’s Reaper capability, the Protector will provide world-leading capability, able to persist for over 40 hours. The aircraft will contribute to homeland and defence tasks across the spectrum of operations, including but not limited to, military aid to civil authorities, and armed intelligence, surveillance, reconnaissance and target acquisition at long range and for long periods until beyond the mid-2030s. The aircraft will be based at RAF Waddington, with planned investment of £93 million to construct a new purpose-built hanger as well new facilities and accommodation for crews. Speaking at RIAT, Defence Minister Guto Bebb said: “Protector’s arrival in the UK marks a significant milestone in our determination to target future threats that we face. The Protector will bring us an opportunity to enhance our armed surveillance abilities and increase our weapons payloads to deter those who seek to do us harm. As well as the demonstration of future equipment capabilities, RIAT featured the next generation of engineers and pilots. A cadet crew as part of a scheme sponsored by Boeing, showed off [the] fully working aircraft that they built.